Plex is a complete solution for local and online media. 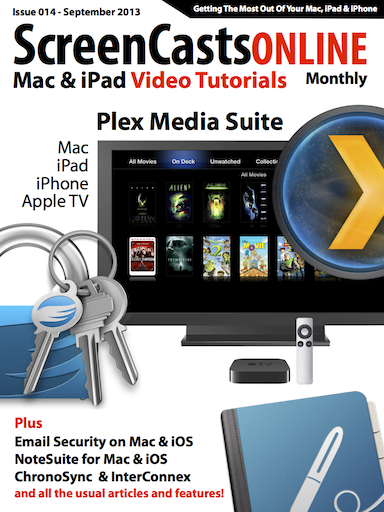 In this show I take you through some of the more advanced configuration options of the Plex Media Server as well as looking at the optional PlexConnect installation on your Mac. PlexConnect allows you to access your Plex Media Server from your Apple TV , without jailbraking your Apple TV. Disclaimer: Apple can stop PlexConnect from working at any time, so there are no guarantees that is will work, even on the day this issue is published. Great show really enjoyed it. However, what happens if your library is in iTunes on an external drive that's about 3TB in size. Can both share the same library? 1- Apple Configurator sees my ATV in the "Prepare" icon but, when I press "install profile" doesn't seem to see it. Ember & Pixa - Organise Your Images tutorial is also available to watch in Issue 14 of the ScreenCastsOnline Monthly As a Premium member, this back issue may be available to you for free, or if published before you became a member, is available for individual purchase as a back issue in the ScreenCastsOnline Monthly Mag application.